Mike Trout, the best player in baseball, looks like he's never leaving the Los Angeles Angels after all. Mike Trout and the Angels are "finalizing" a 12-year, $430 million contract that breaks all kinds of records, according to ESPN's Jeff Passan. The Angels later confirmed they reached a 12-year deal with Trout. The contract is the largest in professional sports history, surpassing boxer Canelo Alvarez's $365 million deal, and it means Trout will not test free agency after the 2020 season. Trout also takes the record for largest MLB contract away from Bryce Harper less than three weeks after he signed a 13-year, $330 million deal with the Phillies. 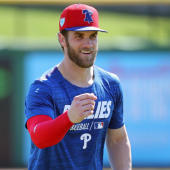 After landing with his new team, Harper was public in his recruitment of Trout, a southern New Jersey native and die-hard Eagles fan. Trout, however, will remain in Los Angeles where he has won two American League MVP awards and has finished second in the voting four other times over his seven full MLB seasons. The 27-year-old enters the 2019 season with a .990 career OPS (175 OPS+) and 64.3 career WAR. Trout, a seven-time All-Star, hit .312/.460/.628 last season with 39 homers in 140 games last season. He led the AL in walks (and intentional walks), on-base percentage, OPS and OPS+. While Trout has been brilliant since he made his MLB debut, he has not had much team success in Anaheim. The Angels have made the playoffs just once during Trout's career and were swept out of the ALDS by the Royals in 2014. The Angels have given out their share of huge contracts, but Albert Pujols' deal expires after the 2021 season and Justin Upton's runs through the 2022 year. Past that, it's only Trout that is on the hook for the Angels. There might be a Shohei Ohtani extension in there at some point, but by no means are the Angels going to be handcuffed from exploring deals to build a team around Trout. As far as what this means for the rest of baseball, the answer is not very much right now. Trout is special. He's a once-in-a-generation player and already has one of the best resumes in history when it comes to his first seven years. What he gets doesn't really apply to anyone else. The biggest thing here is the Angels aren't losing Trout and now they have 12 years to figure out how to build around him. Thus far, they haven't been able to do so successfully.